The Sheep Whisperer: "Uniquely"- Horned Jacob! Sheep have many unusual breeds around the world. One unique breed has been named for a Biblical character who may have been one of the earliest selective breeders on record. The character is Jacob & the breed are Jacob Sheep. I'm usually spotted black & white but variety is nice! This "Kid" Jacob sticks close by Mama! Notice the Kid's spots? 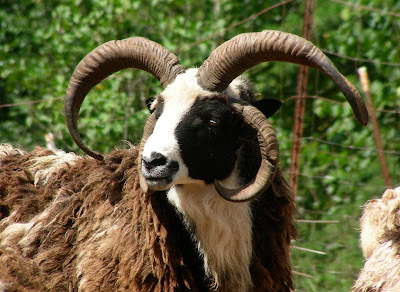 Jacob Sheep are a unique American breed that resemble the earlier British breeds of lean body types.The Jacob's colorful fleeces and prominent horns are stellar. 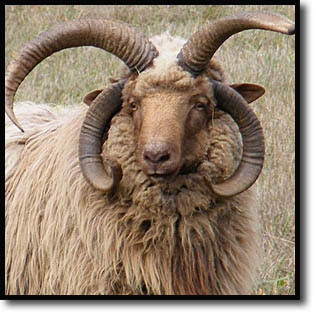 Both males & females have from 2-6 horns, with males having larger horns, some curling up to 2 feet! I don't have black & white wool but I'm still Valuable! Ewe know I'm Ewer Ideal! Just look at me! 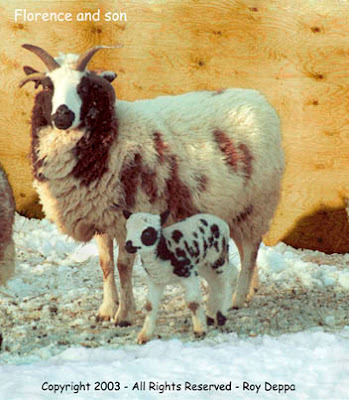 The skin color of the Jacob Sheep corresponds to the wool color. A prime Jacob should look the part. It sports a "badger face", with a white blaze down the front of its face, but a black muzzle & cheeks. 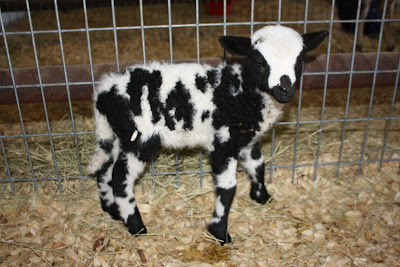 The nose, horns, & ears should also be black, along with the hooves, hocks, & knees. The legs should be primarily white! We have "Biblical" roots dating back to the "Book of Genesis." 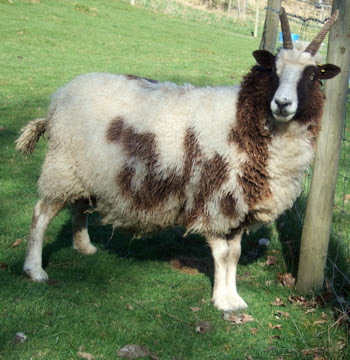 Jacob Sheep average only100-120 lbs., have a medium grade wool, & remain an aging, & for the most part, in tact breed from years ago. 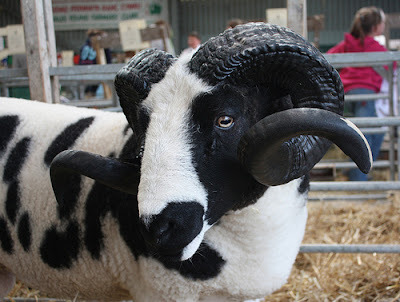 Breeders of these sheep enjoy preserving their heritage, & take pleasure in their Jacob's personalities. Their agility, curiosity, & relative ease in bearing 1 or 2 lambs every spring, add to the delight of breeding this clearly unique breed. Ewe know God is Good when He gives Ewe a Profile like this! 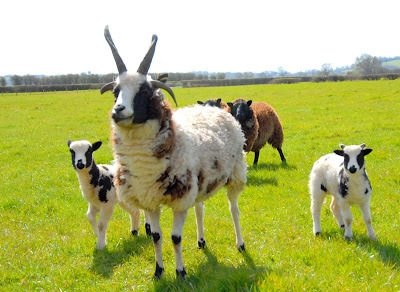 Sheep have many different breeds with just as many distinctive personalities. Even though there's such a variety of sheep, the Good Shepherd is able to celebrate & embrace their differences. 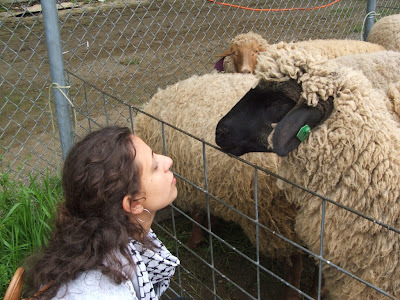 Ewe know that I love Ewe for who Ewe are! Just as Jacob Sheep grow different varieties of wool , so God created each of us as " One-of-a-kind-designs". Celebrate that uniqueness as Ewe interact with those sheep He puts in Ewer path today. very nice pictures n content! love your blog! Thank Ewe, Anonymous! I'm so happy God is using the Blog to bless Ewe! Draw close to Him & He will draw near to Ewe!God Bless Ewe!